The Future Fisherman Foundation (F3) and the Florida Fish and Wildlife Conservation Commission (FWC) will conduct a training seminar for anyone interested in angler and aquatic education training. This year's event will be at the 4-H Camp Ocala (18533 NFS 535 Altoona, FL 32702) the weekend of Oct. 22-23. This seminar is open to teachers, 4-H leaders, Boy/Girl Scout leaders, Future Farmers of America personnel and anyone interested in getting students involved with fishing and aquatic education. Trainers will teach the principles of nationally recognized programs such as Hooked on Fishing - Not on Drugs. "The intent of this seminar is to give everyone a good working knowledge of sport-fishing techniques and aquatic education and instill confidence in them to train others in their respective organizations," said Mark Gintert, F3 executive director. "We also intend to show them a host of other available resources and the next steps for their programs once they get established." Biologists from the FWC will cover a wide variety of topics, including local biology, habitat, conservation, equipment operation and life skills. A primary goal of the FWC is to create the next generation that cares by enabling youth and families to reconnect with nature through a variety of active, nature-based recreational activities. Such activities will enable them to live happier, healthier and smarter lifestyles while becoming future resource stewards (MyFWC.com/Youth). "The FWC is implementing ways to reach out to schools and other organizations that deal directly with students across the state," said Rich Abrams, the FWC's Marine Aquatic Education coordinator. "This event will bring together a diverse group of people who share the same goals of getting students involved with the great outdoors and learning to be stewards of Florida's aquatic environments," echoed Steve Marshall, the FWC's Freshwater Angler and Aquatic Education coordinator. Marshall will help lead the seminar. 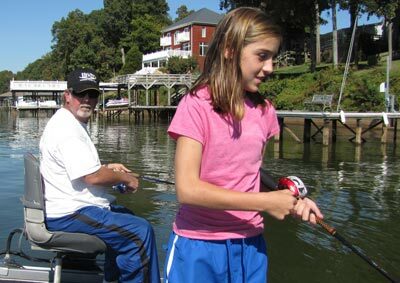 A travel stipend is available for participants through a Recreational Boating and Fishing Foundation grant, making the cost minimal. Interested parties should go to FutureFisherman.org to register. Space is limited, so register immediately. Participants will pay upfront for their stay and meals at Camp Ocala (approximately $73 per person), but the Future Fisherman Foundation will reimburse $150 per person in travel expenses for up to three people per organization. Participants will receive the Hooked on Fishing - Not on Drugs curriculum, fishing equipment instruction and many additional educational tools. This will be an in-depth training that will encompass hands-on equipment use, ways to help youth plan for the future, and environmental stewardship activities for which Hooked on Fishing is known. Instructors for the program will be Mark Gintert, executive director of the Future Fisherman Foundation; Jennifer Saranzak, FWC marine biologist/education specialist in marine fisheries; and Steve Marshall, FWC fisheries biologist in freshwater fisheries. For registration questions, call Steve Marshall at 561-292-6050.